The recent completion of the Upper Texas Coast Section of the Great Texas Coastal Birding Trail has heightened interest in birding and ecotourism in the area. David Baker will talk about some of the efforts being made to promote the trail in South-east Texas, with special reference to the Big Thicket loop, which stretches from Interstate 10 up to Lakes Sam Rayburn and Toledo Bend. As usual, the doors will be open no later than 6:30 p.m., and the proceedings will start at 7:15 p.m. Approximately. 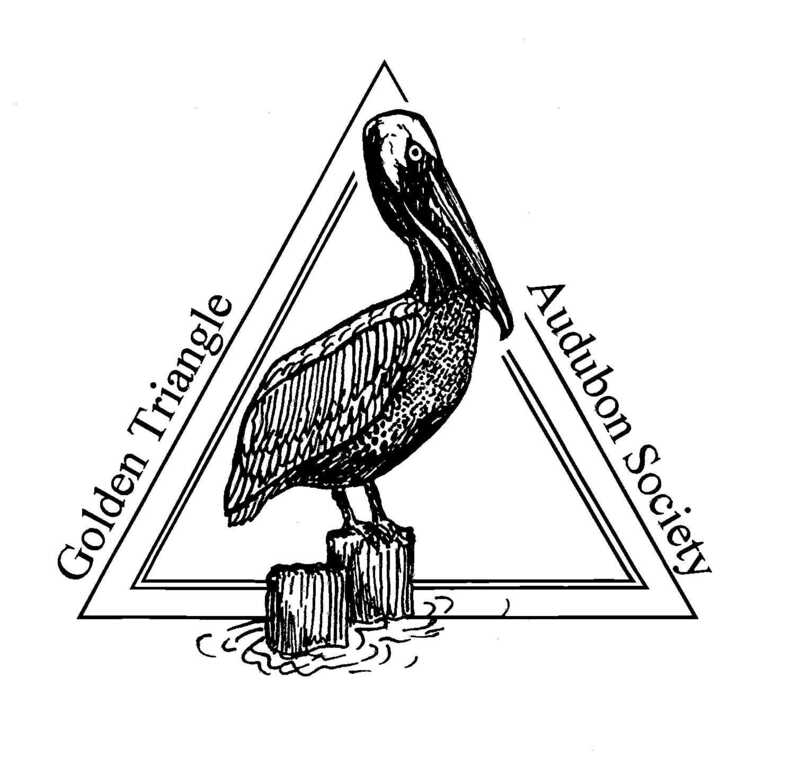 The audubon mission is aptly summarized as the creation of a culture of conservation and preservation of the earth's biological diversity through protection of birds and habitat. On a global scale, one overriding problem transcends all others -- the pressure arising from the earth's ever increasing populaton. As a body of knowledge has increased, mankind has developed and used the capacity to render enormous physical changes to the land surface of the earth. The oceans have not escaped as the ability to harvest the bounty of the sea has reached unsustainable levels. Sustainability -- not taking or using at a rate greater than the rate of replacement -- must be the watchword for all activities which use all forms of natural resources. In some instances, commercial fishing for example, the time scale is short, two or three years at most. In others, forestry for example, the time scale is measured in tens of years, in still others, use of minerals, oil and gas, for example, the time scale is measured in thousand of years. Two issues of truly gobal impact involve the effects of changing concentrations of carbon dioxide and ozone in the atmosphere. There is no doubt that carbon dioxide levels have increased steadily since the industrial revolution began. There is less agreement about both the cause and the prognosis. It is hard to escape the conclusion that the burning of fossil uels -- wood, coal and oil -- has been a major contributor to that increase. However, the fossil fuel resources on the earth are surely finite, even if more extensive than even the most optimistic projections of only a few years ago. Eventually, mankind will be forced to use energy sources which are exxentially non-consumptive as far as the earth is concerned -- solar, wind, tide and, yes even nuclear energy in some form. The net production of carbon dioxide from energy productions will then all but cease. In the meantime, the projections are that the increase in carbon dioxide levels will reduce the radiative loss of reflected solor energy -- the "greenhouse" effect -- resulting in an increase in the average temperature at and near the surface of the earth. But there are many factors not subject to easy evaluations and projection. The oceans slowly -- very slowly -- absorb carbon dioxide from the atmosphere and convert it ot bicarbonates and carbonates, some of which are deposited. In all probability an increase in the carbon dioxide concentration in the atmosphere will lead to increased levels of photosynthesis. (Fortunately, much more photosynthesis is effected by small marine organisms than by green plants and trees.) Photosynthesis uses solar energy to convert carbon dioxide and water to carbohydrates and oxygen, thus counterbalancing the natural activities of all non-photosynthetic organisms and the consumption of oxygen and the production of carbon dioxide (and energy). The other global factor involves the ozone concentrations in the upper atmosphere. Ozone is formed in relatively small quantities in the upper atmosphere by a series of complex gas-phase chemical reactions. In the upper levels, ozone serves to filter out the hight energy ultraviolet component of solar radiation. (At lower levels, ozone is a particularly irritating air pollutant.) the chlorofluorocarbons (CFCs), although excellent fluids for refrigeration processes, are chemically very stable and eventually make their way to the upper atmosphere where they prevent the normal formation of ozone. Ozone levels in the upper atmosphere have declined since the mid-eighties when reliable measurements first became available, and quite probably since the seventies. But unlike the situation with surface air, small bubbles of which become trapped in the polar ice caps as they form, enabling a historical record to be constructed from ice cores drilled in the ice caps, thre is no historical record of the composition of the upper atmoshere. We simply do not know if there have historically been small or large variations in stratospheric ozone levels. The upper level ozone problem is being addressed, essentially worldwide, by changing to refrigerants other than CFC's. However, the process will take decades to complete, even after the refrigerants are no longer in use. But the carbon dioxide issue is less tractable. It seems likely that the earth will experience some surface warming, which will increase the melting of the polar ice caps, and thus raise mean sea level. Given the variables discussed above, there is no consensus on the likely magnitude of the effect, Certainly, the earth has gone through cooling (iceages) and heating cycles before, and natural systems have, to a large extent, adapted. The ranges of many species will shift. the habitat abailable to some will decrease, to others will increase, and populations will change accordingly. Nowhere are populations pressures more apparent than in the loss of tropical rain forests as land is cleared of trees for primitive agriculture. This is almost certainly the most significant current threat to biological diversity as far as non-aquatic species are concerned. Ironically enough, over a perspective of anything longer than a few years, the rain forests are probably capable of sustainably producing more as forests than as agricultural fields which tend to deplete of nutrients rather quickly. Educating the setlers in these areas will be a challenge. These tropical rain forests are home year round to large numbers of species of birds, and also the winter home of many of the migrant species which breed in North America. For the species which breed in the northern tier, the population pressures on breeding habitat are not yet severe. Those breeding further south are not as fortunate. Man as a land manager tends not to like undergrowth, and to disdain variety. Monocultures of same age single species plants and trees are not usually attractive to birds and animals. Undergrowth and brush usually is. Fragmentation of woodlands is another problem. Forest edges although attactive to many birds, render them more vulnerable to predators and cowbird parasitism. the fragments may be just too small in area to sustain a population. The southern tier of North America is the winter home to many species. And as the population in the south expands, the forest ae cut down and fragmented, and much land is consumed into the concrete jungles of the larger cities. Perhaps equally of concern is the disappearance of the coastal prairie habitat, as the land is used from cattle grazing or other agricltural purposes, or is developed. Pressure on wintering habitat can be just as harmful as pressure on breeding habitat. Survival through the first winter is the biggest challenge a bird faces after it successfully fledges. Lack of suitable habitat and pressure from predators sustained by the byproducts of urban and suburban living take a high toll on first winter birds. The birding community has been particularly successful on the Gulf Coast in acquiring some important coastal habitat used by the neotropical songbirds and shorebirds at a critical stage of their migration. Most of these areas are vulnerable to the effects of tropical stoms and hurricanes and should not be developed in any case. Balancing recreational use of some areas with the protection of the wildlife also using them is always a challenge, and not one in which the conservation cause always prevails. one of the big issues in the first part of the century in the southern United States and many other developed areas is sure to be water. These are large areas of desert and semi-desert that are on the verge of being developed in response to population pressures. But the lack of available water makes conventional development impossible. Ecologically, dams are almost always deleterious, and presssure to remove them is increasing, especially in the north western United States. Equally undesirable are the barious forms of river water diversion, for the health of the areas downstream and the coastal estuaries and bays into which they flow depends on adequate flow and the occasional flushing action of higher flows. Although continued vigilance is certainly necessary, the severe pollution problems of the twentieth century are already ameliorated. The case of conservaton is probably not furthred by extremist demands to remove the last few percent at great economic cost or lifestyle disruption. Neithr zero risk nor zero pollution are practical, not technically or economically feasible. There are naturally occurring "pollutants" everywhere in the enviroment and we must recognize that. That is not to say that there are not some further improvements, economically feasible, that can and must be made. What should be our priorities in creating a culture of conservation? First and foremost, Audubon should continue to be a responsible voice of reason and modration. Nationally, we should consider focusing on sustainability and the population pressures, as clean air and water are now widely recognized as neccessary goals. On a state-wide basis, we need to stay on top of the water issues, and promote a conservation-minded stewardship of the ninety-seven percent of Texas land which is privately owned. It is at a state level that environmental education must continue to be promoted. A conservation minded next generation of Texas residents is essential to continued progress. The coastal plain from the Sabine to the Rio Grande is inordinately important bird habitat. Also important is the Rio Grande Valley from the mouth of the river upstream to Falcon Dam and beyond. Including the areas on the southern side of the river, this is an economically disadvantaged region of great population pressure, but also an area of great biological significance. Clearing and fragmentation of the habitat is already a severe problem, and the population of the region must be one of the prime targets of environmental education efforts. Locally, we must continue our efforts. Our coastal wetlands are still threatened by some in local govrnment whose ultimate motive still be to drain them. Our coastal bird sanctuaries must be conserved and managed with the interests of the bird first and foremost. Restoration of coastal prairie habitat is a desirable goal. Just a little to our north, restoration of more areas in what was the Big Thicket should be a priority. Most importantly, adequately wide riparian corridors of mixed hardwoods and pines should be restored and managed with wildlife in mind. Additional larger areas, preferably contigous with existing protected, areas are desirable. But conservation will not happen unless the people and their leaders support it. The goals, the reasons for them and the methods to achieve them must be imprinted on future generations. Environmental education must be the cornerstone of our strategy.